Quinn announced her pregnancy on Facebook with this photo. 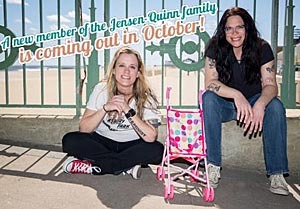 Around mid-April, Asbury Park Deputy Mayor Amy Quinn and her wife, Heather Jensen, began announcing they would be parents for the first time. Quinn, 38, is expected to give birth about Oct. 1. “The response in Asbury Park has been fantastic,” she said. Those who follow the council say they believe this is the first time in memory a councilwoman has been pregnant while in office. “I have every intention of staying on council through and after this pregnancy,” Quinn said. Quinn said she did not want to reveal the baby’s gender at this time.